job_id, prevhash, coinb1, coinb2, merkle_branch version, nbits, ntime, clean_jobs. Can you write step by step formulas how to solve that problem? What must I respond to the pool? Are you aware of the stratum protocol definition? I found a description here: https://slushpool.com/help/#!/manual/stratum-protocol. As a prerequisite, you need to know how block hashes are computed. See https://en.bitcoin.it/wiki/Block_hashing_algorithm for the definition. When you'd compute hashes for solo mining, only hashes that meet the current difficulty are valuable. In contrast, when pool mining, you will submit hashes to the pool which meet a significantly lower difficulty requirement, so the pool can see that you're actually working. The number of "shares" that you produce will determine the portion of the block reward allocated to you when the pool finds a block. I wrote an article a while ago Bitcoin mining the hard way that describes what to do with the values from a mining pool. 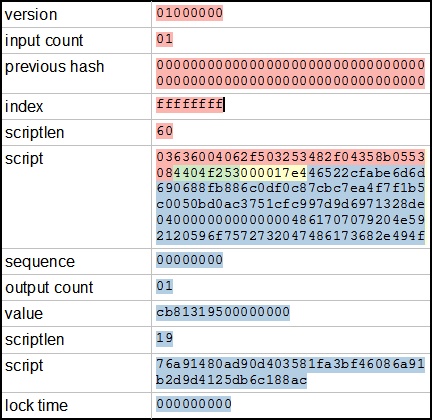 This is combined with the merkle_branch data from the pool to generate the Merkle hash for the whole block. Then you build a block header and iterate over all the nonce values in the header. When all nonces are used, increment extranonce2 and try again. If you succeed, you send a JSON message to the mining pool with your nonces. Not the answer you're looking for? Browse other questions tagged mining-pools development mining-hardware mining-theory algorithms or ask your own question.